Wales full-back Leigh Halfpenny says he is "gutted" he will not have a farewell match for Cardiff Blues because of injury. Halfpenny, who made his Blues debut in 2008, will join French side Toulon on a two-year deal in the summer. The 25-year-old has been denied the chance of a swansong after suffering a shoulder injury in Wales' defeat by England in March. "I would have loved to put that jersey on for one last time," he said. "[They're] a fantastic group of boys and I've loved my time here. I'll miss the squad massively and the fans as well who have been fantastic since I arrived here. "When I had the injury I realised then I'd played my last game for the Blues for the next three years at least and I was gutted." The Blues finish their Pro12 campaign away to Welsh rivals Scarlets on Saturday. 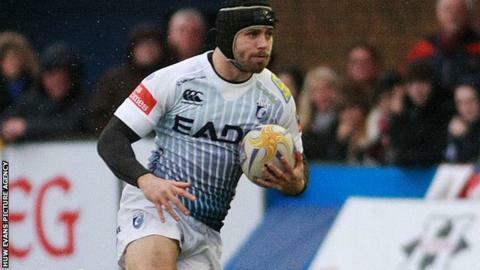 Swansea-born Halfpenny's last appearance for the Blues came in the Heineken Cup defeat by Exeter Chiefs in January, and he will also miss Wales' summer tour to South Africa. Blues along with the Welsh Rugby Union are understood to have tabled deals to keep Halfpenny in Wales, but neither could compete with Toulon's offer. Halfpenny, man of the series after the victorious British and Irish Lions tour to Australia in 2013, will join Toulon at the same time as international team-mate Ian Evans. He cites Toulon's ambition to win major honours every year as the deciding factor in his move. "They're a very ambitious club. They want to win year on year the Top 14 and the European Cup," Halfpenny said. "That was a deciding factor in my decision of how ambitious they are and they want to be the best. "I'm looking forward to meeting up and working with the players out there. They've got some world class there. "Watching their games and having played out there, it's phenomenal when they've got a packed crowd."